BLOOMINGTON, Ind. – Many accountants still are determining how the Tax Cuts and Jobs Act of 2017 impacts clients. Advising clients on tax planning related to the new law was at the heart of a case adeptly handled last weekend by students in Indiana University’s Kelley School of Business. 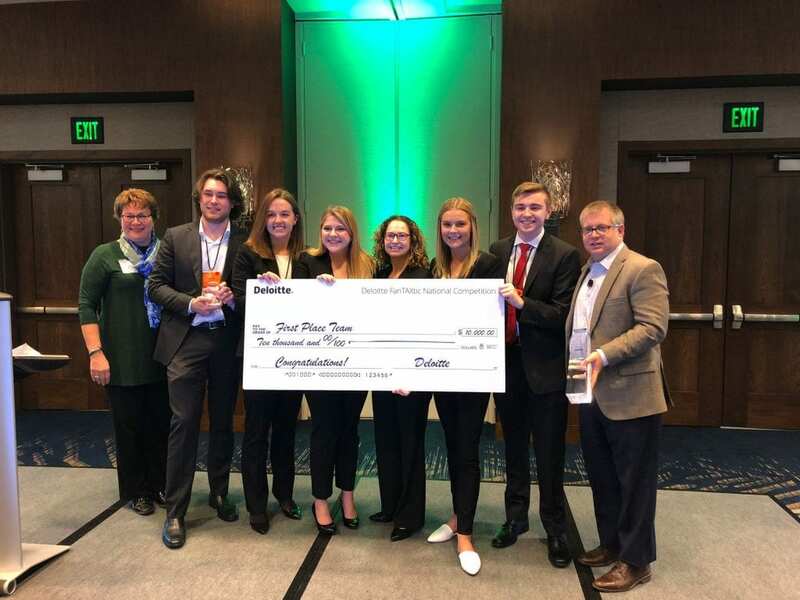 The Kelley School team took top honors at the 18th Annual Deloitte FanTAXtic National Case Study Competition, defeating eight other business schools that sent student teams to the finals. In all, nearly 60 teams representing more than 40 colleges and universities participated in regional qualifier events at Deloitte offices throughout the country in early November. This was the second year that Kelley has sent a team to the competition and the first time it competed in this national competition. Other national finalists included second-place finisher, the University of Illinois-Chicago; third-place team Syracuse University and Fordham University, the University of Nebraska, North Carolina State University, the University of Northern Iowa, Texas A&M University and the University of Utah. “Our Kelley team was amazing,” said Sandra Owen, senior lecturer of accounting and the Kelley team’s faculty advisor. “Although only one of the students had even taken a tax class, they were able to research and understand the relevant tax law, including some challenging new tax provisions, apply it to their client’s situation, and explain their analysis and recommendations clearly and concisely to the client. “I am so impressed with how well they performed, especially under the tight time constraints at the national competition, and how well they worked together as a team,” she added. The finals were held Jan. 18-20 at Deloitte University, the firm’s campus for learning and leadership development in Westlake, Texas, just outside Dallas-Fort Worth. “Kelley prepared me in every way for the competition,” said Katie Roebuck, a member of the winning team and a sophomore majoring in accounting and finance from Carmel, Indiana. “Kelley communications classes in particular helped our team perform well on the technical memo and presentation. “Experience in classes with casework and teamwork allowed our team to dive right into the national cases. We didn’t need to waste time deciding what had to be done or what the cases were asking,” she added. Another team member Lewis Cherry, a sophomore majoring in finance, accounting and international business, added, “In terms of how Kelley prepared us, I would say the difference between us and the other teams came down to our presentation skills. “When putting together a case in just three hours, most teams were going to come up with imperfect numbers. I feel that our ability to put those numbers into a complete, yet easily understandable presentation separated us from the competition – skills Kelley taught us in classes such as C106,” added Cherry, who is from Libertyville, Illinois but originally from England. Other members of the winning Kelley team were Araya Stahoviak, a senior majoring in accounting and finance from Michigan City, Indiana; Curtis Elliott, a junior majoring in finance and business analytics from Stevensville, Michigan; and Caroline Short, a sophomore majoring in information systems and operations management from Indianapolis. Deloitte awarded $2,000 in prize money to each student and another $10,000 to the school. This year’s case incorporated tax reform planning and challenged students to determine whether a fictional company should continue as an S Corporation – which pass corporate income, losses, deductions, and credits through to their shareholders for federal tax purposes — or convert to a C Corporation – which is taxed separately from its owners. Owen said the Deloitte FanTAXtic case competition was a valuable experience for the students. Steve Kimble, chairman and CEO, Deloitte Tax LLP, agreed. “These students are truly getting a real-world experience that introduces them to the possibilities of a career in tax, and they have the opportunity to showcase their technical proficiency and bold ideas to deliver outstanding solutions,” he said. Kelley’s win was noticed by the accounting profession and national media, including coverage by Accounting Today and Inside Indiana Business. Sponsored by Deloitte Tax LLP and supported by the Deloitte Foundation, FanTAXtic has engaged nearly 6,000 students since its inception in 2002. Deloitte has been a strategic corporate partner of the Kelley School for many years.